Reviews are starting to pop up on blogs, and because I like to live dangerously, I’ve been reading them when the alerts come in. (Dangerous because I know not everyone will like the story, and hearing someone rip Once Bitten apart won’t be fun.) Luckily, everything I’ve read thus far has been positive, and I am absolutely thrilled. (4 Hearts) Read more here. While I'm linking you to other pages, head over to the Bell Bridge Blog where I'm guest blogging about how I came up with the idea for my Haven Series. Please stop by and check it out. Also, I am happy to announce the book is back up on Barnes and Noble, so all my links work again. Thanks to those of you who emailed both to let me know about the link glitch, and that everything was working again. It was mentioned to me recently that I never linked my blog readers to the book video my publisher produced. This was totally an oversight on my part--probably because the concept of a book trailer is a little strange to me. Still, it's a cool clip, and when I watch it, I end up with a silly grin on my face thinking "hey, they are talking about my book." It's Monday morning, which means I have cued up the random number generator and drawn a winner for a signed copy of Once Bitten. Actually, I was so pleased with how many people stopped by to enter, I decided to up everyone's odds by drawing two winners. Congratulations! Please email kalayna AT kalayna DOT com (replace AT and DOT with the appropriate symbols) with the name you would like your copy made out to and the address you would like me to ship the book. 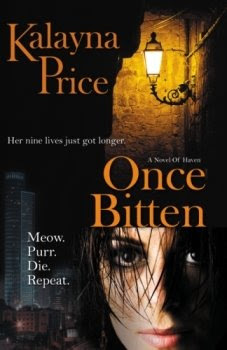 You still have time to enter your name in the drawing for a signed copy of Once Bitten! Click here for more information. On a google chat yesterday, fellow Tri Mu NL Berger was talking about Tag_clouds, which, for lack of a better description, are computer generated word art. 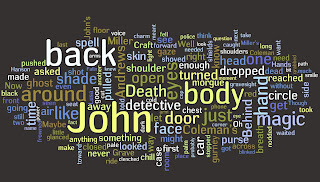 Anyone can create one with Wordle by uploading a block of text. Wordle applies different sizes to words depending on the frequency the word is used in the document. The most common words are the largest. This, I'm sure can lead to cute and interesting images, but the reason Tag_clouds were being discussed yesterday was for their potential as a writer aid. Looking for overused words in a manuscript? Just find the largest words on the tag_cloud. To celebrate the release of Once Bitten, I am hosting my very first contest here on the blog. The rules are simple, just leave a comment between now and 11:59 EST Sunday the 25th, and I'll put you in the drawing for a signed copy of the book. I'll announce the winner Monday the 26th. Hello Blog readers. I just wanted to say thank you to everyone who ordered the book already. My sales rank hit 880 on B&N yesterday, which is better than I ever hoped for. (In sales rank, the closer to 1, the better. I started out at 223k.) Seriously, I fell out of my chair when I woke up to that number! ONCE BITTEN is now available!! My editor wrote me a couple days ago to let me know I'd probably see Once Bitten listed at online stores by the end of the week. I have been extremely nervous since then, and of course, checking the major sites a couple times a day. Well, this morning I discovered both Barnes & Noble and Amazon have Once Bitten up and listed for sale! This news makes me both extremely happy and even more nervous. Now it's out there. People can read it. I can make a rough estimate of everyone who read it before today--it's a relatively small pool of people, and while I don't know all of them, I have some idea who they are. Now the book is out there and has to sink or swim on its own. I hope people love it, but I'm realistic enough know not everyone will. Is there a word to describe feeling both terrified and ecstatic? I wonder if every book release will feel this way? A New Year and New Plans. I've decided not to make any big, year-long resolutions for 2009. I thought about possible resolutions, the list of goals, the things I'd like to achieve this year. . . I didn't write them down. I'm not going to. Not now, at the beginning of the year when everything is blank and unknown. It's the tradition, but I'm opting out. There is a time and a place for pushing yourself hard and reaching for the glimmering goal in the distance. While the beginning of the year sounds like the perfect time to gaze that far ahead, it's really not. At least, not for me. Not this year. Currently, I'm looking at the little goals. The goals that are ten steps ahead, instead of the full mile. I'm gazing across the day, week, or month, instead of across a whole year. Well, I'm back after an extended break over the holidays. (I spent most of my time lacking internet, so I'm still catching up on emails and blogs.) During the break, my publisher sent me a full cover copy of my book. Doesn't it look good? I also received and returned my Author Alterations over the holidays, so my input on Once Bitten is officially over. The book is now off to the printers, and I guess I'll see the first copy of it soon. I'm excited. I hope everyone had a great holiday. Anyone have exciting resolutions for the New Year?